I recently started working on my manifestation efforts much more diligently. After living in Texas, I felt that our time in Mount Shasta has been much more of a rest and rejuvenation period. Mark and I have both been getting inspiration that it’s time to get back to doing what we love. I started my manifestation efforts up again. I have some techniques that have helped me for years to create physical experiences. They’re just tricks that allow me to manage my focus and my attention so that I can attract/manifest/draw in the experiences I wish to play with next. Sometimes those experiences happen quite magically, other times quite predictably. But it doesn’t take long before I start seeing some physical manifestation of my efforts. As I dive deeper into the experience of manifestation, I receive notification that I am going to have to undertake a new project. I don’t want to do this project. At all. I have to do some distasteful work that I am averse to. But there’s no getting out of it; it needs to be done. And it needs to be done now. I can’t even put it off! How can this be? I’ve done so well manifesting in the past, how can this new, awful situation now appear before me as a huge boulder in the road of my manifestation efforts? It was clear sailing before! I was getting things done! I was doing so well! As I sat in front of the computer feeling overwhelmed, frazzled, and anxious, I couldn’t think of anything specific to do. I cleaned out my spam folder. There was an easy task. Then as I sat paralyzed in front of the computer just looking at my empty spam folder, a message arrived. A useless, meaningless spam message. Well, the Divine has quite a sense of humor in my world. The email subject said specifically that I should not worry about this specific problem. Ha. Thanks Universe. I’ll do my best. I am proud to say that it took approximately one day before I turned something awful into something good. Well, as good as it can be, at least. Here’s the thing. I set my manifestation goals pretty high. They say shoot for the stars and maybe you’ll get the moon, right? So, I was targeting something far beyond my current experience. Without giving too much away, I’ll just say that my creation is something I haven’t experienced before by orders of magnitude. Then, this boulder arrives, smack dab in the middle of the road to my goal. Darn boulder! I can either say, “Well, forget about that manifestation. This is my message that it isn’t going to happen for me. I guess I have to stop work on everything.” I can’t say the thought didn’t occur, because it did. But the energetic pattern associated with that thought did not line up with what I felt to be true. Or I can say, “Maybe I just need to clear this so I have no impediments to my progress later.” This felt more like it aligned with my beliefs. I settled on it as my framework for the experience. Then, as I let that thought settle within me, I thought, “Maybe this boulder is a gift. Maybe the work I need to do with it is less of a clearing, and more of a… reshaping. Perhaps I can use this experience to create a ladder of sorts out of this boulder, a staircase that brings me to the next level I wish to experience.” There. Now we’re talking. 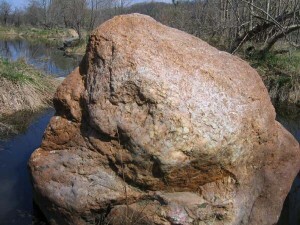 Now I can feel in my body the freedom and acceptance of this boulder instead of the initial resistance. Now when I sit with that thought, I start feeling like this new project is going to create a new, never-before-imagined pathway to my goal. How I carve the ladder out of the boulder will help create the next level of experience. What started out as a horrible sign has now transformed into something meaningful, even something helpful. Instead of stopping work on everything I was hoping to create, I give my attention and focus to BOTH the boulder and my goal. I’m not the only one who has ever experienced the arrival of a block. I’m sure you’re sitting with a boulder or two in your experience as well. You can decide to remove the boulder, give up on it, go around it, or reshape it. Whatever metaphor feels best within you, use it. But never give up on your goal. No matter what happens, stay focused, manage your attention so that it remains ever focused on the goal. It can be very disheartening when you make a decision to head in a certain direction in your life (lose weight, get a degree, start a business, make a move, etc.) and you find the road isn’t as easy as you thought. When you feel that disheartening, see if you can see how the block you’re experience can be useful. What if I manifested this boulder as a necessary step? I won’t know until I get there. I know a woman who went through a painful bankruptcy many years ago. She lost her house, her business, and almost her car. She had nothing, and it was awful for her. But she has used that experience quite well. It was the work she needed to do in order that she could change habits, create new pathways and habits that would serve her later. She now runs a multimillion dollar business that serves her quite well. She used that boulder as a stepping stone to reach even greater heights of experience in her life. No matter what type of block you’re experiencing, play with the idea of what that block is to you. For all you know, it isn’t really as much of a problem or block as you think it is. And even if it is the worst thing that could ever happen to anyone, that doesn’t mean you have to act that role. Imagine yourself doing the work with your block. Give it attention. Shape it into something beneficial for you. And imagine yourself smiling happily as you do it. After all, it really isn’t about that end goal anyway. It is about how you experience the now of the journey getting there. Have a fun journey, no matter how big your boulders are! I love the way you reframed the boulder into an opportunity. Thank you for the reminder of how to use my power of choice to turn an apparent obstacle into an opportunity. This really is great. Good luck with your boulder! I’d love to learn more of your manifestation techniques.